Washers have been the focus of energy efficiency for years. Now you can buy an energy efficient dryer. Heat pump dryers have been produced in Europe for years by Miele, Electrolux, LG, Whirlpool, Blomberg and others. 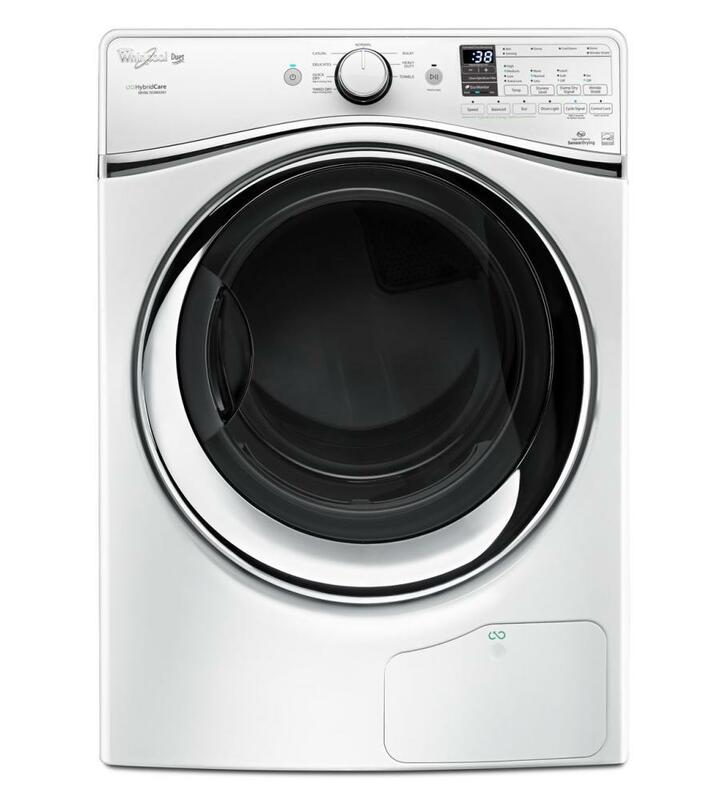 The only two full size dryers with a heat pump available in the U.S. are LG and Whirlpool. We will look at both, the heat pump technology itself and then compare. There are differences worth noting. A typical ventilation dryer works off a “large heater” with heating elements and a main fan. This is known to consume a lot of energy to generate heat. Air is drawn from the space, heated and then blown out the back. 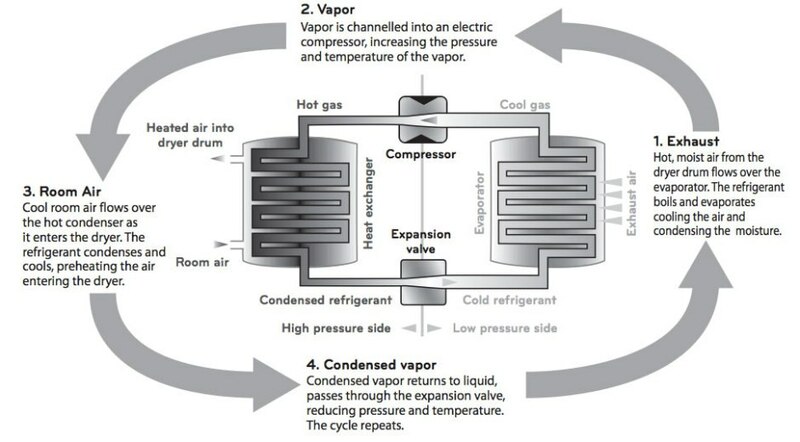 The "heat pump" (compressor), is a high efficiency energy source that creates heat by compressing the refrigerant (similar as to how a refrigerator compression system works). Next, the ‘condenser’ releases the heated air by heat exchange of the refrigerant. A ‘heater’, then raises the heat of the air that comes from the condenser using less energy. Heat pumps also do not draw additional air unlike traditional dryers. In comparison, a traditional dryer with elements, will operate quicker, but ultimately, the heat pump is much more energy efficient. Flexibility - Builders and designers can place dryers anywhere in the home. Energy Efficient - Energy Star qualified and most efficient in their class. LG is a technology company first. Much of today's controls and features were essentially derived from LG's first products. They are in fact a great innovator, but less so on the support and service side. The product is generally reliable, but awfully hard to fix. Whirlpool has always had a strong heritage in residential laundry. In fact, their laundry business really grew out of their early handshake agreement with the then powerful Sears company. Whirlpool is currently recognized as the largest appliance manufacturer in the world. Respective brands in the Whirlpool family include their high-end label of, Jenn-Air, KitchenAid, Maytag, Amana and Whirlpool itself. In many ways, Whirlpool is the opposite from LG. They are not technology focused, but much better on the service and support side. 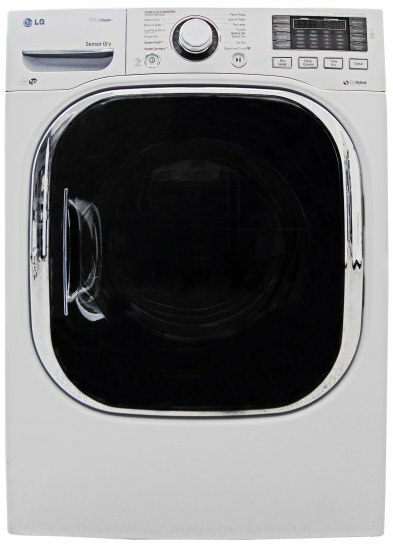 This product is a total departure from Whirlpool, because it is very technology forward. In many ways, they are similar. You can dry with a heat pump, a combination of heat pump and regular dryer or just the heat pump. In other words, you can choose between the speed of regular drying or the energy efficiency of the heat pump. They are very different in terms of exhaust. LG is vented to the outside. Whirlpool, however, is ventless. I like the ventless, because you can now place laundry anywhere with water and 220 volts of electricity. You need a hole to the outside for a vented unit. In terms of sheer replacement, you can do either. I also like the reliability of Whirlpool over LG in terms of service after the fact. Both are good choices, but I prefer Whirlpool. Get The Yale Dryer Buying Guide with new in-depth features on heat pump dryers and technology. Well over 100,000 people have read a Yale Guide.